Uesugi Kenshin was known as one of the most powerful Daimyo during the Sengoku period of Japan. He is famed for his prowess on the battlefield, military expertise, strategy and his worship of the Buddhist god of war. His retainers and generals even believed he was a human manifestation of Bishamonten, and Kenshin's battle standard was the letters 'BI' in the god's honour. Kenshin combined a desire to study, love of campaigning, genuine sense of honour and devout religious beliefs. So dedicated to his Buddhist religion, Kenshin did not marry nor produce a child. He did however acquire a taste for drink, which he is said to have consumed in copious amounts over the course of his life. Kenshin is sometimes referred to by the moniker ‘The Dragon of Echigo’ thanks to his impressive martial arts skills. ‘Echigo’ being the province from which the Uesugi were based. His rival and nemesis, Takeda Shingen was called ‘The Tiger of Kai’. This is interesting because in Chinese lore, the Dragon and Tiger are rivals, who are never able to gain the upper hand over the other; very similar to the relationship that these two Daimyo had with eachother. NOTE; Although he went by a handful of different names, for the purposes of this article I will refer to him as Uesugi Kenshin, the name by which he is most commonly known. His original name was Nagao Kagetora. At the age of 14, after spending seven years at a Buddhist temple studying, Kenshin was approached by several acquaintances and retainers of his deceased father. At the time, Kenshin’s older brother Harukage ruled over the Echigo province. However, he had failed to exert authority over the formidable Kokujin families and thus the province was on the brink of tearing itself apart. A reluctant Kenshin took to battle with his brother and after a series of engagements he successfully replaced Harukage as the head of the Nagao clan. The young Kenshin was then approached by two lords from the Shinano province, they sought his clan’s help in resisting the advance of another warlord; Takeda Shingen. This was around the time that Kenshin had staked his claim to the lord of Echigo province, meanwhile Takeda Shingen had won a handful of major battles in Shinano province. These Takeda clan conquests brought them closer to the borders of Kenshin’s Echigo, thus he agreed to take to the field to oppose the Takeda. The great rivalry the two Daimyo are renowned for today stems from this original contact. The first few conflicts were merely skirmishes, but over the years their rivalry would result in five battles at Kawanakajima. It was the fourth battle of Kawanakajima, in 1561, which is the most legendary and also the only all-out battle they reportedly shared the field on. Uesugi Kenshin would use an ingenious rotating formation, keeping his front line refreshed by switching them to the rear. This allowed the soldiers to get over their fatigue, recuperate their morale and tend to the wounded. This extremely effective formation tipped the battle in his favour considerably. It is also during the fourth battle of Kawanakajima that Kenshin is said to have confronted Shingen momentarily, riding up to him and swiping with his sword. Takeda Shingen fended off the blows with his war fan, or 'tessen'. Uesugi Kenshin was then driven off by Takeda’s retainers. Even though Kenshin had his soldiers employ his inventive rotating formation, the battle was still indecisive. Neither the Dragon nor the Tiger could gain the upper hand. Though the Takeda were not the only enemies that Uesugi Kenshin would face. In 1560 he was asked by Uesugi Norimasa to retake the Kanto province back fro the Hojo, who had expanded and evicted him from the region in 1551. Kenshin and his forces were successful in taking a number of Hojo castles, but this offensive stalled when he struck at Odawara castle. Though he managed to break the defenses and burn the town, the castle itself remained unconquered. The Uesugi forces were forced to withdraw due to lack of supplies. It was during this campaign however that Kenshin adopted the Uesugi name and title Kanto-Kanrei. Another province which was of great interest to Uesugi Kenshin was Etchu. For years he played mediator between the feuding Jinbo and Shiina clans. Later though, he sided with the Shiina and took over the Jinbo clan. Later still, Kenshin would turn on his former allies the Shiina and take the province as his own. 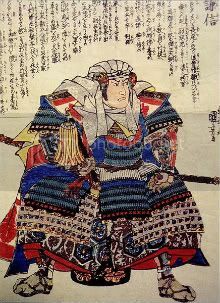 In approximately 1576 Uesugi Kenshin was in a position to consider Oda Nobunaga as a possible threat, for Nobunaga had had grown to be Japan’s most powerful Daimyo, holding the territory in and around the capital Kyoto. By this point though, Kenshin’s enemies Takeda Shingen and Hojo Ujiyasu were dead and so the previous barriers to his expansion were reduced. 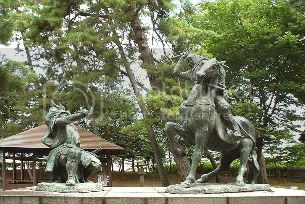 Oda Nobunaga had also noticed his counterpart to the north and in response mustered his forces to meet the Uesugi at Tedorigawa. According to some sources, Nobunaga’s general Shibata Katsuie marched with 18,000 men, with Nobunaga himself following up with 20,000. Despite the Oda’s overwhelming numerical advantage, Uesugi Kenshin managed to score a massive victory, in no small part thanks to the tactics mastered during the skirmishes between he and the Takeda. He baited Nobunaga by pretending to send a portion of his force in a flanking attack. Nobunaga could not resist the opportunity and sent his men forth to attack what he assumed would be a weakened remaining force. Instead, Oda’s forces found the full military might of Uesugi Kenshin waiting for them. The hasty attack cost Nobunaga nearly a full quarter of his army, forcing him to withdraw. Kenshin, satisfied with his victory marched back to Echigo. Seemingly with the intent to put together a grand army and continue assaults into Oda’s realm. Unfortunately, his plans were not seen through. At the time he was in rapidly deteriorating health, reportedly unable to eat much solid food and walking with a severe limp. It is said he suffered a seizure of some variety and died shortly after, his ambitions incomplete. Of course, the timeliness of Kenshin’s death fuelled a rumour that Nobunaga had arranged for his assassination. The story goes that Kenshin was impaled by a ninja who had hidden beneath his latrine. An unlikely story, as the theory generally accepted by most scholars is that a lifetime of heavy drinking and maybe a form of stomach cancer closed this chapter of history. Impressive article there Afty. Love the use of pictures to break up the monotony of the, interesting but visually bland, wordplay. Cannot think of any criticisms at the moment, so all good. Thanks Scip, I think he is one of my favourite Daimyo, and the relationship he had with his rival Shingen is fascinating. Whilst I was doing my research for the article I noticed a couple places claiming he may have actually been a she. It was mostly speculation but an interesting proposal nontheless. Women samurai were not exactly uncommon, coupled with Kenshin's regular stomach aches (which those who proposed this claimed as evidence for a menstrual cycle) provide a reasonable amount of intrigue. The main source was a spanish trader who had dealings with him and in a letter back home he described Kenshin as a woman throughout. I am beginning to be amazed at the number of high-quality leaders produced in the various factions at this time- much like the Romans coming up with their great leaders/orators/personalities at approximately the same time- Caesar, Marius, Sulla, Pompey, Cicero, Agrippa, etc. It was an exciting time in Japan, that's for sure! Great article about a quite interesting leader. He must be good if he managed to defeat the impressive Oda. Uesugi Kenshin would use an ingenious rotating formation, keeping his front line refreshed by switching them to the rear. This allowed the soldiers to get over their fatigue, recuperate their morale and tend to the wounded. I think the Roman legionaries after the Marian Reforms did something like this as well. A good tactic to use in battle though! - It also hypothesises that Kenshin's death was then, in fact, due to a Menopausal disorder/disease. Although a lot is baseless speculation it is a fascinating possibility, despite the fact that many of their points decides to completely ignore the first part of Kenshin's career.